This link CAMINO de SANTIAGO will take you to our main Camino pilgrimage index page from where you can access over 60 pages of information about the Camino. There is a full guide to the French Way plus information about planning a pilgrimage, the Pilgrim's Passport, the Compostelana etc. If you visit Galicia you will see countless people walking towards Santiago, often with backpacks and hikers attire. Many of these travellers also carry a long staff with a shell attached to the handle and look some what dishevelled. These people are holy pilgrims making the centuries old pilgrimage known as "el Camino de Santiago" (the way of St. James). The pilgrim pictured below is not in fact genuine, but a paid "actor" in the Obradoiro square. He is dressed at it is thought St. James would have been on his arrival at Galicia. These pilgrims, usually catholics, travel to Santiago from all over the world although the majority originate from Spain, France and Italy. It is the route, or routes, that they follow that are known as "El Camino" and the oldest one starts in France some 900km (650 miles) from its ultimate destination. The serious pilgrims, who walk the entire route, can expect a journey of approximately one months duration, with the added bonus of very sore feet. Many do however claim to have a revelation on achieving their goal. If you are interested in undertaking the pilgrimage, you can do so at a minimum of expense, as free lodgings are provided along the entire route. There is also a book you can sign as proof of your journey's completion at Santiago de Compostela's pilgrims office near the Cathedral. 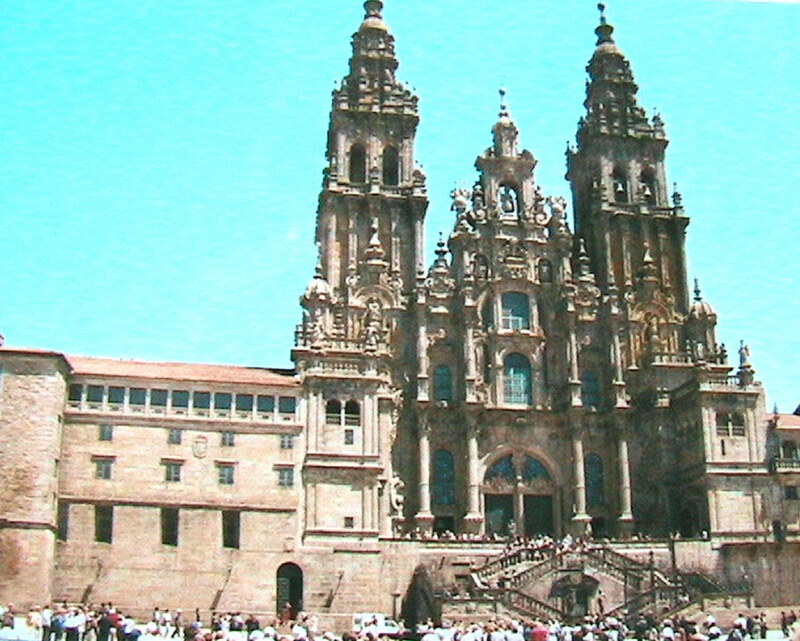 The objective of the "el Camino de Santiago" pilgrimage is to reach the large cathedral at Santiago de Compostela and visit the shrine of the apostle whose tomb rests there. Over the years however two other rituals have evolved. One is the touching of the statue of St. James behind the main altar, for which there is normally a long queue and a significant wait. The other is the tapping three times of the pilgrims head on a large column just inside the "Portico de la Gloria" (arched entrance to the cathedral). The pilgrim (or visitor) also places their hand on a designated spot on the column during this ritual. In the early days of the pilgrimage, the pilgrims would depart from their own homes and take whatever course was the least hazardous, but today whilst the same holds true, there are a number of designated routes which most pilgrims elect to follow. Above, a shot of destinations end, Santiago cathedral, courtesy of Laurie Lambert 1999. Pilgrims intending to walk "el Camino de Santiago" (Lit. the road to Santiago) travel from all over the world although the majority do originate from Spain. The route (or partial route) that many follow starts in France some 900km (650 miles) from its ultimate destination, but there are several different points of origin from the various extremities of Galicia's four provinces. The committed pilgrims, who walk one of the complete routes, can expect a journey of approximately one months duration, with the added bonus of very sore feet. Many do however claim to have a revelation on achieving their goal and there is often much camaraderie between fellow travellers. If you are interested in following the pilgrimage you can do so at a minimum of expense as free lodgings are provided along the entire route at designated hostels. For the successful "perigrins" (as they are called in Spain) there is also a register that is signed at the walk's completion at the pilgrims office in Santiago. On completion of the pilgrimage and arrival at the Cathedral for mid day mass, the travellers can expect a service steeped in history and tradition as well as religion. Amongst other things a massive incense burner called a "botafumeiro" is swung above the heads of worshippers in Santiago's cathedral transept filling the building with incense and creating an ambience that has barely changed over the centuries. 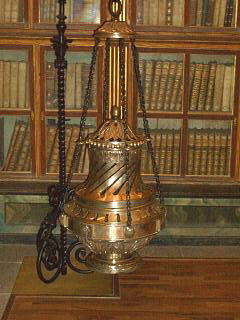 Right, a one and a half metre high botafumeiro in the cathedral's museum. Recognising the traditionally dressed pilgrim is easy as most walk with a long crooked staff topped with a clam shell. These large scallop shells adorn not just the staffs of the pilgrims, but also appear in image form on buildings, gates and other structures and are a bit of a mystery. They are actually called the "Saint Jacob's Shell" (Viera in Spanish) and their contents are a culinary delicacy throughout Spain. Records of their existence and connection to both Santiago and the pilgrimage date back to the 11th century, but the reason behind their significance has been lost. One suggestion, which seems highly plausible, is that the shell could have been used by a traveller as a scoop for water or a small food dish. The shells are large and hard and also have a semi serrated edge, so they may well have functioned as some kind of universal tool. If you want to know what one of these shells looks like, they are similar to the "fan" shaped shells found on many beaches around the world. If you have taken a holiday in Florida, then they are a good match to those found on the west coast of Florida around St. Petes, Tampa etc. In 2003 the irritatingly infamous British art critic, Brian Sewell, had his rather unreligious Camino pilgrimage from France to Santiago broadcast on British TV. He travelled his final leg (quite appropriately for him) on a donkey (although he spent much of the rest of the journey in an executive German car, albeit self driven). Although a "fallen" catholic and now a committed atheist, Sewell still found the journey quite moving and spoke to many genuine pilgrims on route who found the whole experience a personal revelation. Sewell, although frequently "cheating" in his car, commenced his journey from the original starting point and highlighted the various churches and cathedrals passed on route making the trek not just a religious, but an architectural and cultural one. Despite my sarcasm I would recommend the series of programs to anyone interested in the pilgrimage, churches, history, Galicia, or of course the charismatic, stylish and highly self effacing Mr Sewell himself. 2010 was a special Jubilee Year for Santiago and its famous cathedral. These holy years only arise every ten years and they see an increase in the number of pilgrims completing their Camino and visiting the city. The significance of this event is also highlighted by the opening of a special gate to the cathedral which only occurs during Jubilee years. Another unusual event that featured in this Jubilee year was the release of a film about the Camino, namely the movie The Way, starring Martin Sheen and directed by his son Emilio Estevez. The movie is about a personal Camino made by an American doctor. Santiago's holy pilgrimage was acknowledged by UNESCO (1987) for its cultural importance. For general information about the city, follow this Santiago link back to our entry page about this famous location. For more on the Camino, see the links below. For information about a 32 day personal trip along the Camino de Santiago by a friend of ours, click on this link My Camino journey. There you will find a short taster of this adventure along with aurl that takes you to the blog of the complete pilgrimage. For something slightly different, see this additional Camino de Santiago page to find out about a novel concerning Priscillian, a one time Bishop of Avila, and a modern day pilgrimage and the story between the two.